**Note: This book is part of the "Perfect" series, but it can be enjoyed as a stand-alone novel. 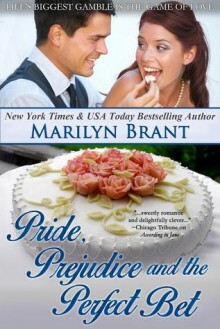 **The course of true love doesn’t always run smooth -- not even for millionaire bachelors…Everyone thought Beth Ann Bennet and Dr. Will Darcy had an unexpected romance in Pride, Prejudice and the Perfect Match (Perfect #1).Now, Beth’s best friend, Jane Henderson, and Will’s first cousin, Bingley McNamara, begin their own unlikely love story in Pride, Prejudice and the Perfect Bet (Perfect #2), which starts at the Bennet/Darcy wedding when the two of them find themselves in the roles of maid of honor and best man for the newlyweds.Jane is an interning school psychologist and a woman who wears an angelic mask in public, but she’s not as sweet tempered as she’d like everyone to believe. Turns out, she may have just crossed paths with the one person who’ll unnerve her enough to get her to reveal her true self.As for Bingley, he’s a wealthy, flirtatious, compulsively social guru of finance, who likes to wager on stocks and, let’s face it, on just about anything that strikes his fancy. But this dedicated ladies’ man may have finally met the woman who’ll challenge his bachelor ways! Pride, Prejudice and the Perfect Bet…where life’s biggest gamble is the game of love.